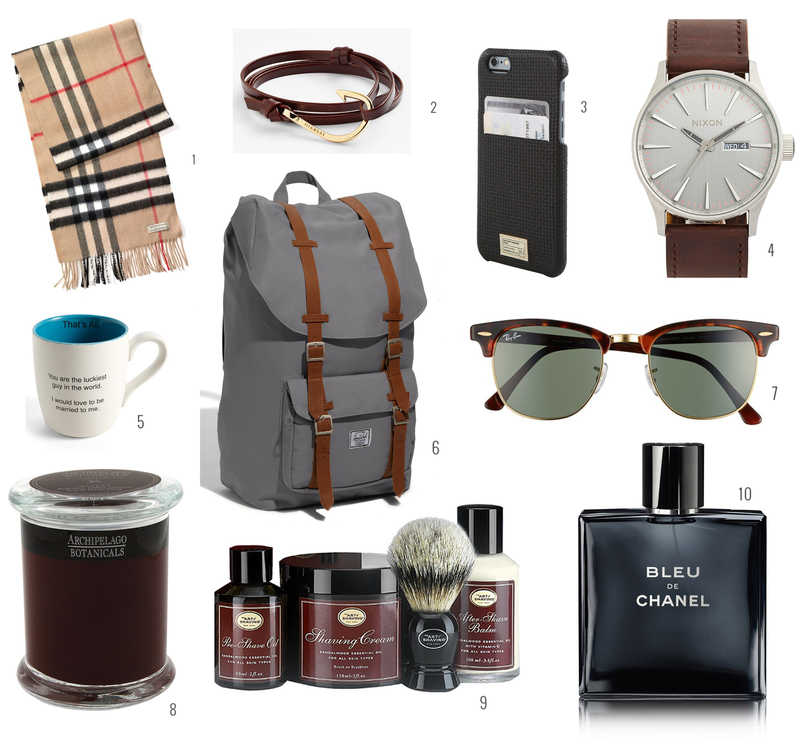 I was perusing Nordstrom’s Valentine’s Gift Guide For Him, and I pulled some of my favorite finds! These gifts range from bargain to go-for-broke luxury, and are pretty neutral in terms of style and interest. I hope it helps you find something awesome for your Valentine! 1. Burberry Scarf (THE SPLURGE). There’s legitimately no way I could ever spend $400 on a scarf, but it’s the ‘one day I’ll get this for him’ idea… and it’s just such a classic. I’m actually not even sure if my boyfriend would wear this. But I think it’d look good on him, and that’s what counts…. right?? 2. Leather bracelet: I’m not always a fan of men’s jewelry, but I think this is rugged and masculine. It’s a tad pricey, but I think it’s a really beautiful piece. 3. Phone/wallet case: This one is pretty awesome because my boyfriend may or may not have a habit of losing his wallet…. (sorry Dave) so this makes for an incredibly useful and thoughtful gift! And it’s a pretty low-key style. Only $40! 4. Nixon watch: My boyfriend has this watch and loves it… I happen to love it, too! I think it’s a classic and stylish piece, and would make a great gift. 5. Mug: this one is kind of a joke (but also kind of not). I’m not married (… yet) but would totally have something like this in the house. As a joke, of course. 6. Herschel backpack: This is an awesome gift for any guy who loves travel, especially if you’ve got a trip coming up! I got the matching travel case for my bf for Christmas. I love the look and style of Herschel stuff; it’s masculine, clean, and subtly stylish. 8. Mandle (man candle): I’m a huge fan of Archipelago. I’m also a huge fan of making places smell good. I’m not here to name names or point fingers, but sometimes guys’ rooms don’t smell awesome. It’s not their fault, of course, but dirty laundry, sweat on sheets, farts… you get it. And this one doesn’t smell like a Britney Spears perfume. Yay compromise! 9. Shave kit: This is just a super cool gift for any guy (who has facial hair, obviously). Again, it’s super masculine, neutral, etc etc. I found this on Nordstrom’s site, but a guy friend told me you can find much less expensive ones elsewhere. 10. Chanel Bleu: The obvious choice for me, a sucker for anything Chanel. It just happens to smell amazing, so maybe this is a selfish gift choice. Feeling inspired? Romantic? Like you need your next paycheck to deposit already? Me too.